Gōpālannāyaruṭe tāṭi / Ur̲ūb. Kōl̲ikkōṭ : Navakēraḷa Kō-ōppar̲ēt̲t̲īv Pabḷiṣiṅṅhaus, 1963. From the University of Chicago Library. 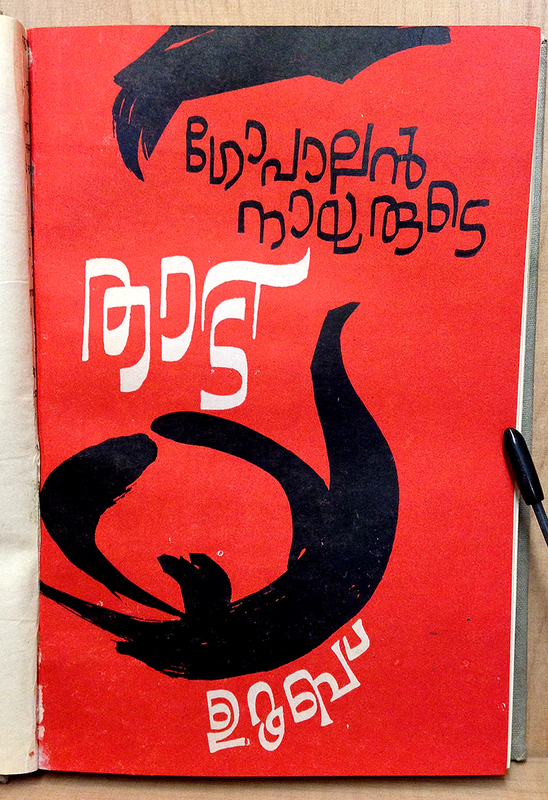 ഗോപാലൻ നായരു‌‌‌ടെ താടി Gopalan Nayarude Thaadi by ഉറൂബ് Uroob. Uroob was a famous Malayalam author of novels and short stories. The best translation I could get from this title was “Gopalan Nair’s beard”! How odd! Although now I can see that the black abstract shape in the middle of the cover is a moustache and beard. Apparently the book was turned into a 1999 Malayalam movie. This is a good example of how traditionally round forms can be modified to have straight edges. It also shows some pre-orthography reform letters.